Carnival Corp recently celebrated the addition of the 100th ship to their fleet. Last Friday, passengers across all ten brands celebrated the accomplishment. There was a champagne toast (provided by Carnival) at dinner for all 227,000 passengers. (Can you imagine what 227,000 glasses of champagne cost?) After dinner it was up to each brand and ship to decide what they wanted to do. AIDA is Carnival's German brand, and on the AIDA ships, they had a deck party. You don't have to speak German to understand the video below from AIDAcara. It shows the German people know how to party. But then again, you get the feeling that these people would party for any reason - like even Carnival's 27th ship. This is it. Grand Princess left the Grand Bahama Shipyard, and has arrived in Ft. Lauderdale. The first passengers are now aboard the "new" Grand Princess enjoying the new piazza and other new facilities. Martyn gives us a final tour just before Grand Princess sailed this evening for Europe. Want to see more of how it all happened? Princess has a photo journal that details the work being done in all the areas over the last 23 days. The completed areas are being handed back to Princess by the contractors and Grand Princess is getting set to sail from the dry dock. In today's episode, Martyn shows us some of the completed areas which have had a spectacular transformation from their "construction state" just a couple of days ago to clean and polished today. Princess' photo journal is updated every day with additional photos of other projects nearing completion aboard Grand Princess. A passenger was reported overboard on Tuesday from Celebrity Millennium which has just sailed from Cabo San Lucas to San Diego. The 63-year-old woman was last seen Monday evening while the ship was at sea. It was realized she was missing Tuesday when she did not disembark the ship for US Customs clearance. All passengers were required to clear customs at San Diego since it was the first port of entry back into the US as the ship sailed from Ft. Lauderdale to Vancouver. Celebrity Millennium sailed from Cabo San Lucas on Sunday at 3pm. After the ship was searched, the woman was reported to the Coast Guard, the FBI and other authorities as missing at 1:15pm (Pacific time) Tuesday afternoon. The Coast Guard launched an air and sea search over the route the ship had traveled into San Diego. Celebrity says that a subsequent search of the ship's closed-circuit camera recordings has shown the woman climbing over the ship's railing on Deck 4 Monday evening at 9:12pm and letting go. The ship's position at that time has been communicated to the Coast Guard so they can refine their search based on the location and the currents. The Coast Guard suspended the search on Wednesday without finding the woman. The complete story appeared in the May 4, 2011, edition of Cruise News Daily. The clock is ticking down, and the work aboard Grand Princess is getting close to being finished. In today's video from the yard, Martyn takes us to the Horizon Court, one of the first areas to be completely finished after renovation and handed back to Princess. He also takes us under the ship to see the painting of the ship's hull. The video closes with Royal Princess arriving at the Grand Bahama Shipyard today for its transformation to P&O's Adonia. Royal Princess left the Princess Cruises fleet today when it was handed over to sister brand P&O Cruises. The ship will be converted to P&O's needs at the Grand Bahama Shipyard and be rechristened Adonia on May 21, 2011. Video of the handover is below. Few ladies who agree to be godmothers these days understand the singular honor the cruise line has extended them. They can make it a unique experience that few will have, but so many just come do what's required, pick up their check, and be on their way. It seems that few these days even bother to sail on their ship. Dame Shirley Bassey will be the godmother of P&O's newest ship, Adonia, and christen the ship in Southampton on May 21 (2011). She gets it, as you can see in this video. It's only a couple of days until Grand Princess leaves the drydock in the Bahamas, and today Martyn shows us some of the nearly-completed projects. Will everything be ready in time? There are only four days to go until passengers embark on Grand Princess. In today's video from the drydock, Martyn looks around the new piazza and how all the new venues surrounding it are coming together. There's more to see. Princess updates their photo journal every day with additional photos of other projects underway aboard Grand Princess. 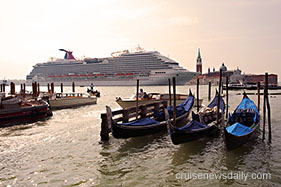 Carnival Magic arrived in Venice for the first time yesterday morning (April 30, 2011). It made for a stunning sight entering the city's Grand Canal as shown in the photos on the CND website. This week's news from the cruise industry presented by Cruise News Daily includes items about Royal Caribbean's winter 2012-2013 winter schedule and the trends in it, including a surprising one for Miami. It also includes an item about Carnival reaching the milestone of 100 ships in the fleet - and dropping back to 99. Our feature story is Royal Caribbean's explanation of why they aren't worried about their 11-ship European deployment. We also have items about Port Everglades, Juneau and Gibraltar.